This is test 6 in a series of real-world examples where Tableau capabilities are compared to those of Power BI (PBI). Once again, a completely random example was selected for this test with no pre-conceived notion of how each tool would perform during the test. The inspiration for this test suddenly emerged today as I watched the great Joshua Milligan (aka the VizPainter) demonstrate the capability that Tableau 10.2 now has for directly reading shapefiles. This test represents a challenge in which I thought PBI would have an advantage over Tableau. 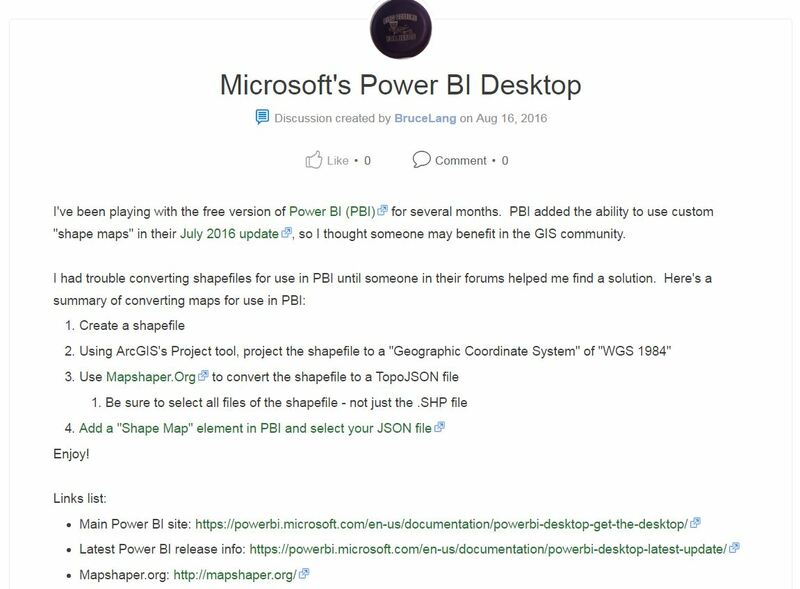 I remember reading an article several months ago about the Power BI and ESRI collaboration that would enable shapefiles to be used in Power BI. As shown in the video below, this article was from several months ago. Based on this I was fairly confident that Power BI would be ahead of Tableau for reading shapefiles, especially since Tableau 10.2 is only a couple of weeks old. As a practicing geologist, I have been dabbling with GIS tools and techniques going way back to the late 1980’s. I have used many different systems for many different types of applications. For this reason, I’ve got a pretty good idea of the importance of spatial files and how powerful they can be. For six years, I was the group leader of the Environmental Modeling Center of Excellence at Jacobs Engineering. Although I am not an ESRI GIS expert, my groups used ESRI products extensively for the environmental modeling and engineering work that we completed. It wasn’t uncommon for us to be spending upwards of 100K per year per seat for the full complement of ESRI GIS products. Doing GIS work in those days was not cheap but it was a necessity to handle the types of data we were collecting and using. Now I will ask you to fast forward about a decade, to about two weeks ago. Tableau software released version 10.2, which has a new type of data connector called a spatial file. As far as I know, Tableau isn’t asking me to give them an additional 100K per seat just because I now have this capability. In fact, I think it has not cost me anything additional! I believe that this feature will be just as important to me as was the original mapping capability that was added to Tableau on or about version 4.0. Back on that day in late 2008, I knew that something special had just happened in Tableau. I now feel the same way with this recent capability being added to the software. Based on my background, including articles like this one I recently wrote, I was very eager to try this new type of data connection. As luck would have it, I watched a demonstration of this technique today and I thought it would make a perfect example to include in this series of articles. The short (5 minute) video shown below explains what I accomplished within 10 minutes of opening Tableau 10.2 for the first time and connecting to a shapefile for the first time. The spatial file I used for this test is an ESRI shapefile, as is shown in the video. You can click here to retrieve these files if you are interested in trying this for yourself. Based on this experience, all I can say is “Wow”. Once again, Tableau has integrated an immense amount of power into their product. The simplicity of use, the seamless integration of the spatial files as a new data source has now elevated Tableau further into the stratosphere in my eyes. The Tableau development team nailed this one and I can’t wait to explore it further. This new capability adds an entirely new dimension (no pun intended) to the work that I will be able to complete in Tableau. I think my previous crush on my secret French mistress named Tableau has now turned into a full-blown infatuation. When I first thought of this test, it was near the end of my workday. Once I returned home, I downloaded and installed the latest version of PBI and got to work. As I began, I checked the clock to be able to report how long it took me to make progress on this task. The first thing I had to do was learn how to implement parameters in PBI. I found an article that gave me some guidance on this topic, and after of few minutes of paging down, down, down, I got glassy-eyed and wished that parameters in PBI were as easy to create as they are in Tableau. Regardless of that emotional let-down, I maintained my focus and enthusiasm and I continued to feel hopeful that I would be able to reproduce the time-based dashboard functionality I showed in the Tableau test. Without delay (since I was on the clock), I quickly moved onto determining how to connect PBI to the shapefile I used in the Tableau test. Since I had no clue what this meant, I had to do some studying. As usual, I learned many new things about PBI. When a new item in PBI is in “preview mode”, these features have to be activated in the options menu before they can be accessed. Even after you activate them, they cannot be fully utilized and tested with your own data. The preview mode does not offer PBI users the complete functionality of these features that they will eventually have once the features are released. The term “preview mode” is a good one for this situation and does not equate to a alpha or beta test period like you get with Tableau. The shape map functionality is still in preview mode as shown in Figure 1. I spent about 45 minutes reading these articles, watching videos and doing some additional research to make sure I understood the situation. After I activated the Shape Map Visual feature in PBI, I realized that PBI is currently not going to let me complete this test. There are a number reasons why this is the case, but the basic problem is that I cannot directly connect to a shapefile in PBI at this time and the software will not allow us to use our own files for testing. This was the biggest let-down of the night. However, based on what I learned and saw in the videos, there are good things coming to PBI with respect to working with spatial files. This video gives a good summary of the things to come for this topic. Shape Map visuals are based on ESRI/TopoJSON maps which have the compelling ability to use custom maps that you can create, such as geographical, seating arrangements, floor plans, and others. 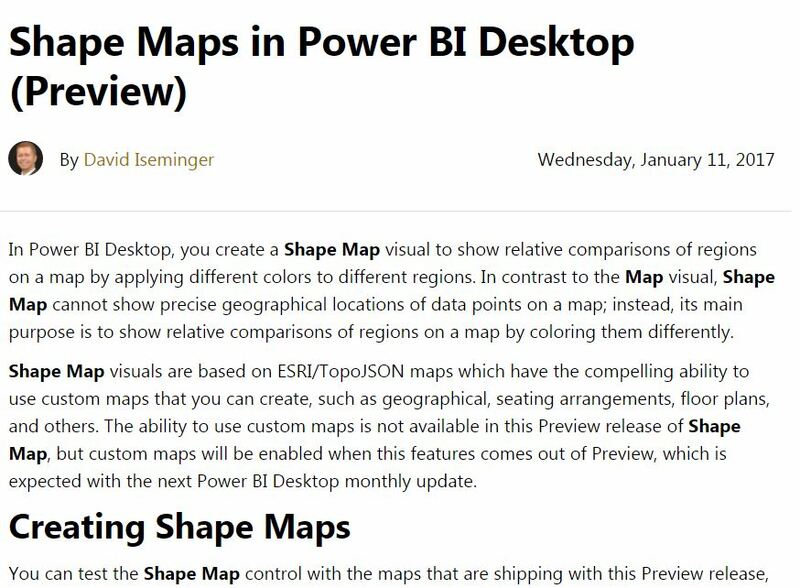 The ability to use custom maps is not available in this Preview release of Shape Map, but custom maps will be enabled when this features comes out of Preview, which is expected with the next Power BI Desktop monthly update. I expect that eventually we will be able to use our own shapefiles in PBI, rather than just information provided to us from the ESRI websites. There are some people that have tried to convert shapefiles to the TopoJSON format for usage in PBI, but according to the documentation I found, we cannot use our own files at this time. Therefore, I didn’t even try to make the needed file conversions. It sure would be nice if we didn’t have to convert shapefiles for usage in PBI! 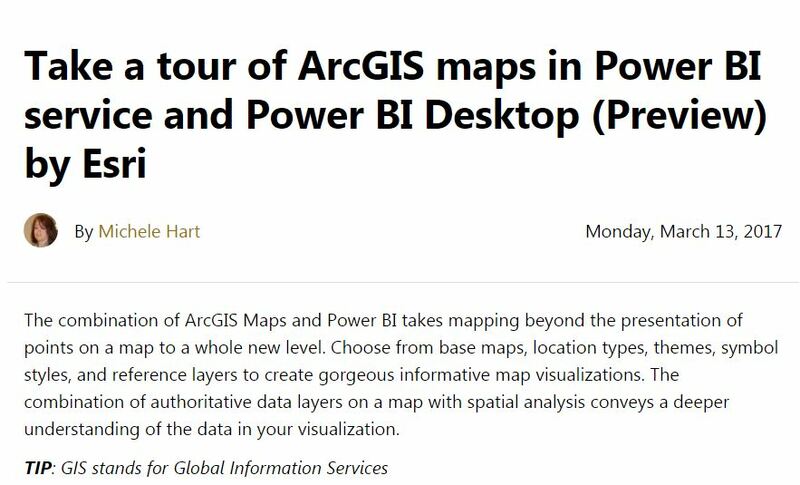 Depending upon how you interpret what Microsoft says versus what ESRI says, there is some indication that this complete ArcGIS integration into PBI is going to fall short of the Tableau spatial file implementation that has already been completed. The usage of ArcGIS maps will be nice for PBI users, but directly reading and using shapefiles might not give users the same degree of shapefile control that is already present in Tableau. Only time will tell what emerges from this product, but for now I see this as being no different than custom map backgrounds that can be added to Tableau. For more complete mapping capability, the Mapbox integration that already exists in Tableau might be a good comparison to what this technology will become in PBI. I get a sense that the shapefile usage in PBI is going to be more about extending mapping capabilities rather than having true spatial file functionality as you would have in a GIS system. The new mapping features include having different map backgrounds, demographic coverages as map backgrounds, and being able to use smart map themes. The only feature I see that resembles a GIS function is the ability to make area-based selections, as shown in Figure 2. Figure 2 is taken from the website that discusses the ESRI perspective on this new feature. At this time, I believe that the complete description of this topic is not yet available because the product is under development. Figure 2 – The ESRI perspective on using ArcGIS maps in PBI. For now, this direct comparison test will have to be postponed until PBI can directly read shapefiles. Once that happens, I’ll complete the test and revise this article. This was originally written on 3/15/17. Click here for the summary article that has links to all the previous articles written in this series. The new Tableau data connector called “Spatial file” is not just another data connector. This thing will unleash a new wave of creativity and innovation in the Tableau product that will rival everything we have seen come before it. The reason for this is simple: there are countless treasure boxes of data stored in companies that before now have been only accessible to the people empowered with GIS tools. Tableau has given us the key to unlock these treasure boxes of data. GIS data has now been unleased into the Tableau workspace, with all the metadata intact and accessible. This powerful combination is surely going to explode into a wave of new visualizations that are powered by amazing data sources that contain in-depth data and hidden insights. A year or two from now, I’ll be looking back on this article with a smile on my face because it will be shown that I correctly predicted the future. I can only imagine how much work it took the Tableau development team to create this type of data connection. Great post, as usual. Something to think about with the shape file connector – it goes much deeper than this as I wrote about today – https://blog.databender.net/2017/03/19/beyond-shape-files/. What’s been built is a fundamental understanding of spatial objects as a data type and as a mark type. Right now we only have the file-based connector exposed in the UI, but you can load data from sources if you are prepared to write a little code using the Tableau Extract API. Over time we’ll see more functionality surface into the product, but the foundations of this thing are deep and strong. Thanks and I’ve been enjoying your articles, too. This addition to Tableau is going to be transformative.